COAT By Malene Birger. PEARL EARRING Sophie Bille Brahe. KNIT Filippa K. JEANS J Brand. BOOTS Emerson Fry. BAG Proenza Schouler. SUNGLASSES Céline (similar ones here). This entry was posted in Outfit and tagged malene birger, pearl earring, Sophie Bille Brahe by Carolina Engman. Bookmark the permalink. You look wonderful! By Malene Birger coats are always fantastic! Maleine Birger is such an amazing designer! I love the simplicity of the coat and how you styled it accordingly! Simple yet chic! I love this outfit! The color and fit of that coat is so gorgeous! Love the outfit, the sunglasses seems like the Audrey Hepburn ones! This coat is absolutely perfect! Malene Birger definitely knows how to make it to look so! This is look is timeless, and that’s one of the reasons I love it! Lots of love from Helsinki, Finland! I’m a medical student and a fashion blogger. New outfit post up on my blog Arctic Vanilla! 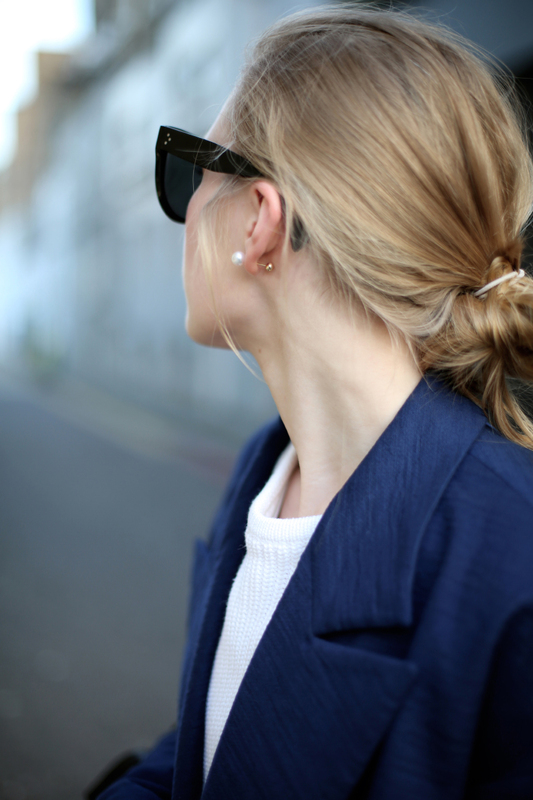 I love your Sophie Bille Brahe earring, it’s so beautiful! Navy blue + black is my fav!! Love it! Gorgeous outfit! The coat is amazing. The coat is absolutely beautiful, but that earring even more, I am dying!! The coat is great, indeed! Obsessed with that pear earring! gorgeous. the coat is amazing. Gorgeous jacket, love the colour & fit. Indeed a beautiful coat and a gorgeous colour! Enjoy NYC with your family! Great look! 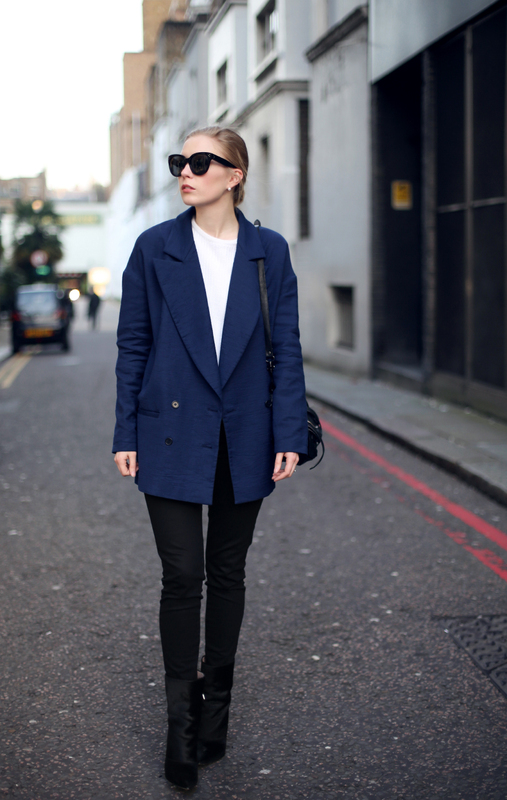 Love the coat and the sunglasses – you are my style inspiration for sure! This is like a casual blazer. It’s oversize which I like and I love the shade of blue as it’s fresher or clearer than a usual navel blue! the coat has an amazing colour! the coat is awesome i have to say that. you have a good taste about wearing.